Samsung has announced the development of a unique "graphene ball" that could make lithium-ion batteries last longer and charge faster. In fact, Samsung Advanced Institute of Technology (SAIT) said that using the new graphene ball material to make batteries will increase their capacity by 45% and make their charging speed five times faster. It was also said that batteries that use graphene ball can maintain a temperature of 60 degrees Celsius that is required for use in electric cars. SAIT's team used a chemical vapor deposition process to grow a graphene–silica assembly, called a graphene ball. Each graphene ball is composed of a SiOx nanoparticle center and surrounding graphene layers, constituting a 3D popcorn-like structure. 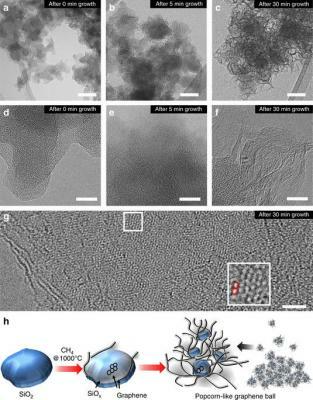 The graphene-ball coating improves cycle life and fast charging capability by suppressing detrimental side reactions and providing efficient conductive pathways. The graphene ball itself also serves as an anode material with a high specific capacity of 716.2 mAh g−1. A full-cell incorporating graphene balls increases the volumetric energy density by 27.6% compared to a control cell without graphene balls, showing the possibility of achieving 800 Wh L−1 in a commercial cell setting, along with a high cyclability of 78.6% capacity retention after 500 cycles at 5C and 60 °C. Samsung has patented the technology in South Korea and the US.